Residents and community stakeholders gathered together last week (18 May 2017), to celebrate the official launch of Olifantshoek Solar Street Light Project, a REISA Economic Development Flagship Project. “This project is very significant, as it has the potential to change the landscape of this town. On a deeper level it adds to our collective commitment to make this Province a safe and prosperous one for the benefit of our people living in it. Where there is light, there is life and this project indeed has its benefits in ensuring that there is not only light, but that we are safe and secure walking the streets,” commented the Premier of the Northern Cape, Ms Sylvia Lucas, at the launch of the Olifantshoek Solar Street lights project. 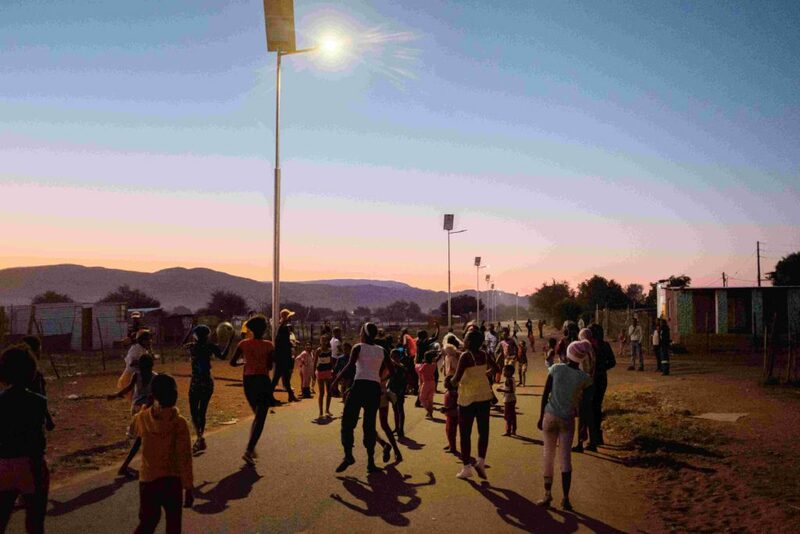 Olifantshoek is the second community to benefit from REISA’s Solar Street Light programme, an initiative that aims to improve community safety, security and social livelihoods of around 10 253 residents, in addition to taking advantage of this environmentally friendly solar-powered technology. What’s more the 105 solar street light units that have been installed along Olifantshoek’s busiest main roads require almost no maintenance and zero running costs. “The Project was proposed by the Mayor of Gamagara Municipality, Ms Dineo Moyo,, in the hope to reduce crime, motor accidents and most importantly to better the social livelihoods of its community at large. It is REISA’s deliberate strategy to, where appropriate, partner with local authorities and stakeholders to ensure alignment of REISA’s interventions with local priorities” commented Sizile Mabaso, Chief Community Operations Officer of REISA. In 2015, the Dibeng community were the first beneficiaries of REISA’s Solar Street Light programme, which included the installation of 52 solar street lights covering over 2km of road. The Project is without a doubt a shining example of how a successful public-private partnership, between REISA and Gamagara Local Municipality, can impact so positively on a local community. This Project has provided the added impact of providing business support and mentorship to a local business. The company has been able to further develop its trade within the solar industry, in particular solar street lighting. “Through our Enterprise Development Programme, REISA’s objective is to facilitate the creation of sustainable economic and job opportunities for the communities of Olifantshoek, Dibeng, Dingleton, Kathu, Babatas and Mapoteng to achieve greater economic independence,” added Mabaso. In conclusion, Premier Sylvia Lucas said, “I wish to thank REISA for this project and the many others they have already embarked on in the Northern Province, and look forward to a long and positive relationship”. With a total output of 75 MW REISA will generate approximately 175,000 MWh/year of clean, renewable energy to the national grid and when operating at full capacity, it is expected to supply enough green electricity to power approximately 50 000 medium-sized homes South African homes.